This photo is not only shown but repeated as the header picture for over 30 photos in a banner. It’s Jessica Nigri, she is great by the way, and very nice. Hardly worthy of criticism. Which person was important in this photo? The girl with the midriff who looks underage? Good Guest shot? or selected for abs? This is news coverage of spring break at Lake Havasu. The post brags about all the 18 years olds in bikinis. I would NEVER post this, except to show that the East Valley Tribune is ok with virtually naked bloody people. Cara Nicole, AZ Powergirl right, a personal friend, ok in the newspaper, not ok on my site? Great people, Caitlin Fluck and Kurt Colin, recently married at Phoenix Comic Con, this taken in public, but not ok on my website, fine in newspaper? Black cat outfit, too much cleavage for my critics, ok for the Tribune? Toni Darling, super sweet person, made this Lady Thor famous. Ok for Tribune, too racy for my site? 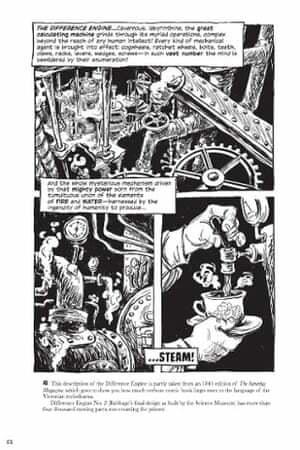 Sydney Padua’s graphic novel tells the story of Babbage and Lovelace with a twist – they actually build their Analytical Engine. To see a selection of extracts from the book, click here. ‘Surely there must be a couple of new Ada Lovelaces lurking in this land?” exclaimed digital doyenne Martha Lane Fox last month, as she issued a call for women to turn their hands to tech – part of her new plan, dubbed Dot Everyone, for an internet-savvy nation. It’s little wonder that the enigmatic daughter of Lord Byron has been put, posthumously, on a pedestal. 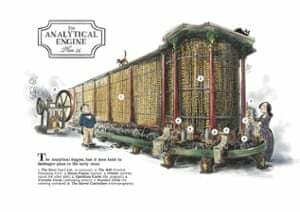 Brought up to shun the lure of poetry and revel instead in numbers, Lovelace teamed up with mathematician Charles Babbage who had grand plans for an adding machine, named the Difference Engine, and a computer called the Analytical Engine, for which Lovelace wrote the programs. 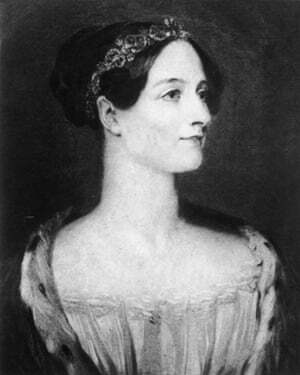 Then tragedy struck – Lovelace died, aged just 36. They never built a machine. But now the mother of computing might finally have the chance to realise her own potential. As the eponymous stars of a new graphic novel The Thrilling Adventures of Lovelace and Babbage, the pair have been resurrected to finish what they started. 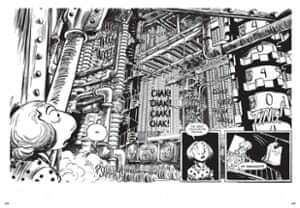 “I guess it just seemed like a really stupid ending, that they didn’t build the machine,” says author Sydney Padua, a London-based computer animator. “Plus I really wanted to draw comics … and you can’t draw very good comics about dead people and their machine they didn’t build!” Having first illustrated the duo some years ago to mark Ada Lovelace Day, the annual celebration of women in science and tech, the comic’s huge popularity spurred Padua to develop the cartoons on her blog and ultimately unleash the book. Exploring, then rejecting, the sad fate of Lovelace and her plans, Padua turns the tables on history, setting the aristocrat to work building a mechanical behemoth. The upshot is a pipe-smoking, jodphur-wearing steampunk technologist who would startle even Lane Fox. It doesn’t end there. 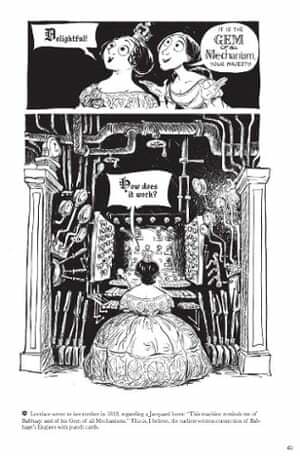 Having built a technological masterpiece, a series of madcap escapades ensue in which Lovelace and Babbage are joined by a host of Victorian celebrities, from the ultimate client from hell, Queen Victoria, who demands the machine be used for fighting crime, to novelist George Eliot, who finds herself lost in its maze-like interior. “It really is very much about my own experiences in the labyrinth of computing,” says Padua. But if the reborn mathematicians find building a machine something of a handful, they aren’t alone. In trying to present an accurate depiction of the analytical engine for an explanatory appendix (shown here), Padua discovered there was little to go on, and found herself rifling through the work of Babbage scholar Allan Bromley for design clues. “I just sat down, basically, with the Bromley papers and whatever of Babbage’s plans I could get my hands on through fair means or foul,” she says. The result is a shining feat of engineering that her dynamic duo would be proud of. A rip-roaring caper engulfed in footnotes of quotes, quips and illuminating asides (Babbage, Padua reveals, gained notoriety as the scourge of street musicians), the book does more than simply celebrate the genius of the first computer programmer, it encourages us to turn our imagination to technology – just as Lovelace did. 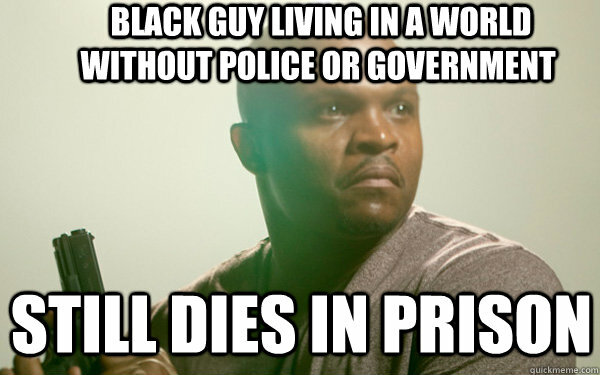 And that’s an inspiration to us all. 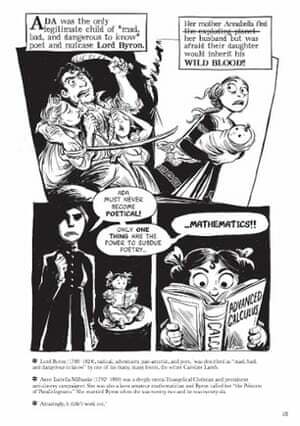 Sydney Padua’s new graphic novel, set in Victorian London, tells the story of Ada Lovelace and Charles Babbage’s attempts to invent the first computer, with cameos from George Eliot, Charles Dickens and Isambard Kingdom Brunel. 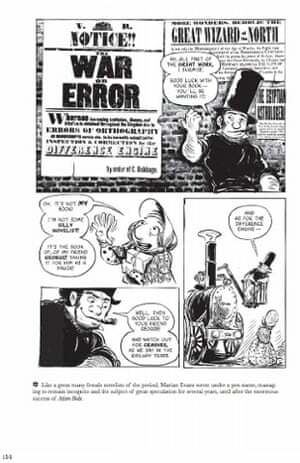 A fictionalised version of Babbage’s ‘difference engine’ is intricately explained. Queen Victoria investigates the machine, with mixed results. Mary Ann Evans – aka George Eliot – meets Isambard Kingdom Brunel, on her way to visit the engine. George Eliot encounters the fantastic engine, which puts her new novel through its ‘orthographic standardizer’. 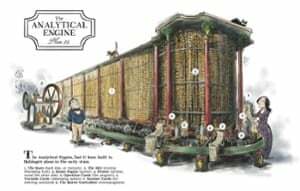 The analytical engine as it might have really looked, recreated to the precise specifications of Lovelace and Babbage’s designs. Cute dog pictures to start your week off good. Enjoy! There is no such thing as grape ice cream. The reason? It has a lot to do with dogs, girls, the 1876 World’s Fair, pharmaceutical companies, and it’s more complicated than you might ever imagine. After his successful invention of the ice cream soda in 1874, Philadelphia’s Robert Green began to tackle a request from his customers. Green boldly stated, in an 1876 interview with the Pennsylvania Inquirer, “The people are tired of vanilla and chocolate. They want something more.” What Green did not know, is that grapes contain a special molecule Anthocyanin that prevents freezing, so he kept turning up with grape milk. Companies such as Baskin Robins made a few futile attempts, but failed because of the anthocyanin. No breakthroughs were made until 1976, when Ben from ‘Ben and Jerry’s’ decided to try his hand. As it turns out, he was motivated by a challenge from Jerry’s attractive sister Becky. Ben confessed in a People Magazine interview in 1984 that he had a huge crush on Becky and promised to create the flavor just for her. Knowing the history of grape ice cream, she coyly requested it, thinking it to be impossible. Ben began to include the grape skin and juice to better see the differences between batches. While he didn’t understand the science behind this at the time, he found that including the skins increased the levels of anthocyanin enough to make the ice cream freeze. “Becky was impressed. 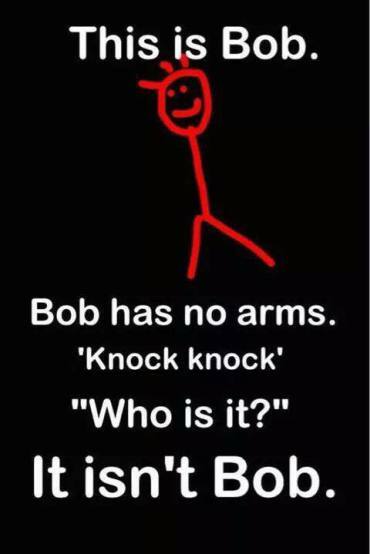 We were at her house, alone. I gave her the scoop – on a cone. I was really getting somewhere. She was laughing and happy. She couldn’t believe I did it. I’ll never forget what happened next. Ben relayed this information to the pharmaceutical industry, and in 1982 the FDA banned the sale of research of any grape flavored ice creams or sherbets, natural or artificial due to pet hazards. This ban is in effect until 2028. 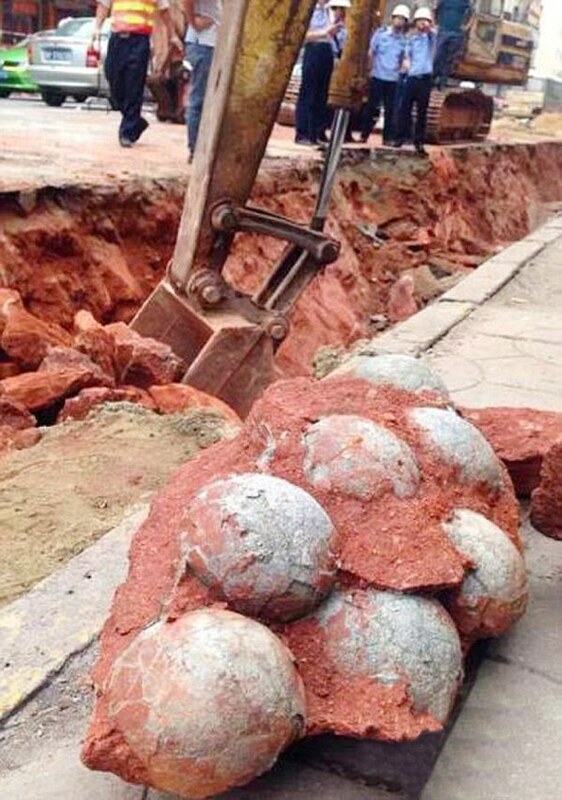 A giant clutch of 43 fossilised dinosaur eggs were discovered by workmen doing roadworks in China. 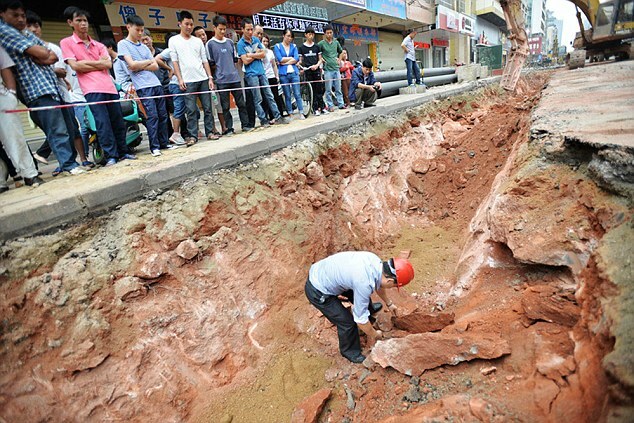 The egg-straordinary find was made in the city centre of Heyuan, south-east China, by workman laying a sewage pipe. 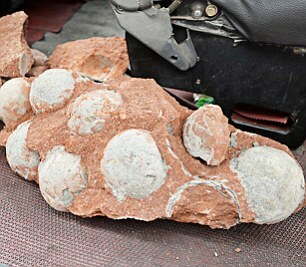 The giant fossils, which included 19 eggs that are fully intact, were the first to be found in the city and are now being studied by experts from the Heyuan Dinosaur Museum, to determine the type, the People’s Daily Online reports. Each range from 10 to 12 centimetres in diameter and have been well preserved by the red sandstone beds in the area. 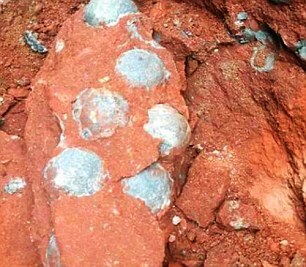 One worker even tried to flee the scene with two of the rare fossils but was stopped and eventually fled empty-handed. Passers-by then formed a human chain to protect the site until police came and the artifacts were taken away for examination. 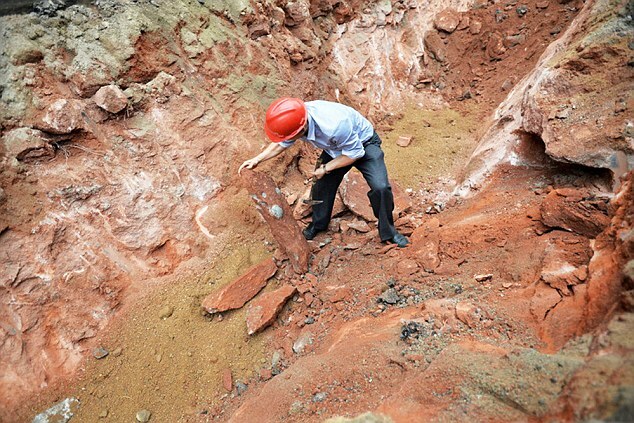 Head curator Du Yanli said: ‘There are fossilised dinosaur eggs everywhere in the red sandstone layer but they were never found because the city was built on top of the layers. ‘With the recent road and sewage system upgrade, the red sandstone layer is being exposed and has led to the discovery of the fossils’. 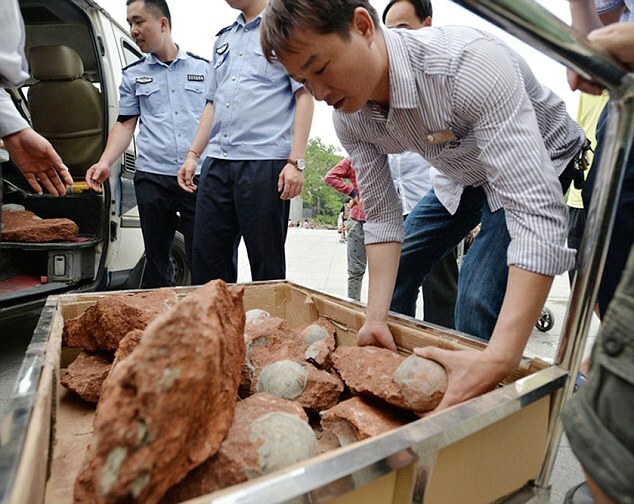 The Heyuan Dinosaur Museum said that more than seventeen thousand fossilised dinosaur eggs have been found in China since the first discovery in 1996. The museum prides itself for having the largest fossilised dinosaur eggs collection in the world. Heyuan has now dubbed itself as China’s ‘home of dinosaurs’. Work has temporarily halted as a 1.3 square kilometre dinosaur fossil and geological protected zone is set up in the area for further scientific research.